The Siemens Healthineers site in Swords opened in 1966 and we are proud of a long tradition of benefitting patients everyday through our leading medical technologies. We currently manufacture three products for the Siemens Healthineers Laboratory Diagnostics business; our instruments perform tests in hospitals and laboratories across the world to diagnose and monitor patient health. Over the past 50 years, Siemens Healthineers has had an active CSR programme with employees engaging in a range of community and environmental projects in the Swords locality. Our longest partnership is with Swords Meals on Wheels. Swords Meals on Wheels provides an essential service to the local community on a completely voluntary basis. Five days a week it serves vulnerable people, providing both hot meals and a friendly face to a diverse client base. Some are unable to cook for themselves or recently discharged from primary care facilities. While others may be elderly homeless clients living in local B&B accommodation with no cooking facilities of their own. The clients are referred to Meals on Wheels by local health nurses, hospital social workers or welfare officers. 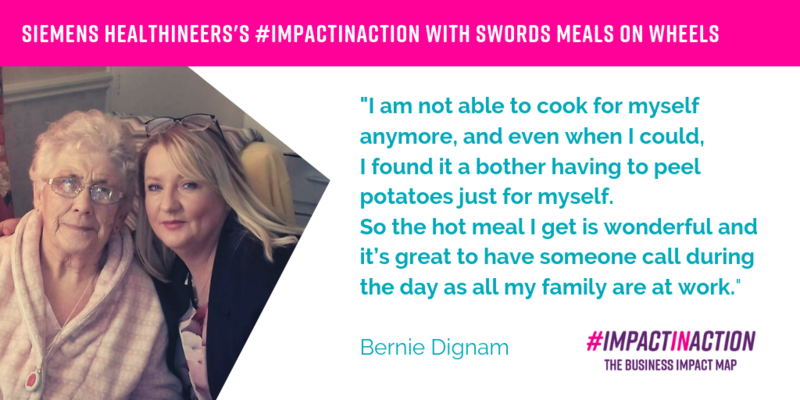 For over 30 years Siemens Healthineers has donated hot meals annually for forty two weeks of the year. Since 2011 we increased the supply to twelve meals daily and to fifty one weeks annually. In total we have donated over 87,000 hot meals to the vulnerable people in the locality. We recently visited one of the recipients to see for ourselves what this programme means to them. Bernie Dignam is an eighty-four year old widow who lives alone and is unable to cook for herself. We were delighted to see first-hand the positive impact we are having on some of the most vulnerable in our community. This partnership supports UN Sustainable Development Goal no. 2. Zero Hunger and target no.1, by 2030, end hunger and ensure access by all people, in particular the poor and people in vulnerable situations, including infants, to safe, nutritious and sufficient food all year round.